Cloud Of Lakitu: iPad 2 Announcement!! 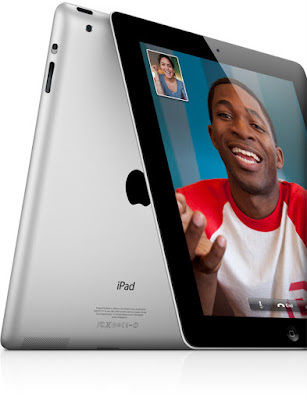 On March 2nd Apple announced the new iPad 2 and based on most of the rumors leading up to the event proved true. Smaller form factor, dual core chip, cameras, same price. I am hoping to unload my old iPad and pick one of these up because well it's new, but also the smaller size and front facing camera are worth it for me. Unfortunately Apple is selling the first generation for a discounted price, so I won't get as much return now as I would have a couple weeks ago. Still I will end up paying only about $150 for a new one with half of that coming from change I have accumulated at work. While the iPad2 seems like the biggest announcement from the other day I think there were to other things specifically in the little iOS 4.3 software update of more importance. First, is AirPlay video support availability in 3rd party apps. This will let people view live video from the MLB At Bat app on the big screen (assuming MLB allows it). My guess is that initially video apps like Hulu Plus, Xfinity Tv and the ABC player won't support it because they want people to get TV content from the cable providers. However, with the new HDMI cable available for the iPad2 you can mirror your screen to the TV and see the content anyway (well played Apple). The other big change in iOS 4.3, which seems like a small feature and doesn't seem very practical for everyday use is iTunes Home Sharing support. It basically allows you to play any content in your iTunes library on your iOS device. All you have to do is enter credentials and be on the same network and you can watch a movie that is on your computer. I could see maybe watching a movie on your iPad that you don't want to actually put on your iPad or maybe using your iPhone in an iPod dock to play music you don't typically keep on your iPhone. Okay so great I will use that feature once to try it out and then maybe a handful of times besides that if I even remember, but mostly it will go unused like Compass, Weather, Stocks and the Contacts apps on my iPhone. Where this starts to get interesting is with Apple's rumored "cloud based" iTunes. There are tons of rumors swirling about Apple doing something with the "cloud" and iTunes or MobileMe. The most recent and ideal rumor is the ability to access any song you have purchased from iTunes via the "cloud". Your iPhone would no longer have music on it and instead would just let you stream any of your music over the internet. You would also be able to get a new computer, login to iTunes and magically all of your music would download to the new computer (this is currently the case with App Store apps). The rumors also expand on this to not only include music, but other types of media too, like photos, movies, etc... I am looking forward to this because I wouldn't have to worry about running out of disk space anymore it would all get uploaded to the "cloud". Anyway back to iTunes Home Sharing. The biggest hurdle in making this dream a reality are the record companies. It is in their best interest to make you buy new music for each device and also re-purchase music if you inadvertently deleted it. What if iTunes Home Sharing wasn't limited to just being on the same local network, but was instead expanded to be the internet. Now I would start using iTunes Home Sharing all of the time. No more loading my iPhone with music instead I could just stream it. No more picking and choosing which movies to put on my iPad, I would have access to all of them. It wouldn't be as great as if it was stored at Apple, but it would go a long way to making my life easier. So two small things that could dramatically change how we access media in the coming years, all released as part of a minor software update. Steve Jobs should have saved them for his "One More Thing". Nice!! !